The State of Palestine and the Socialist Republic of Vietnam have a long traditional friendship relation. The two peoples have always consistently supported each other during their struggles for independence and freedom. 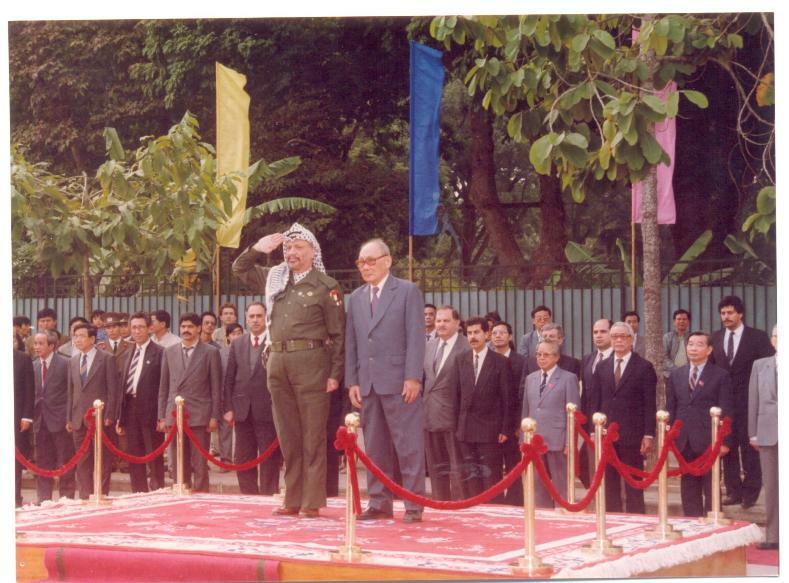 The formal diplomatic relations between Palestine and Vietnam was established on November 19th , 1988 when Vietnam was one of the first countries in the world recognizing the State of Palestine and officially transformed the resident Representative Office of Palestine Liberation Organization (PLO) in Hanoi into the Embassy of the State of Palestine. However, it was by no means the beginning of the relationship between the two countries. Political ties between Palestine and Vietnam long preceded the establishment of full diplomatic relations and were very strong already in the 60s of the last century. Vietnam and PLO established ties in 1968 and then PLO opened its resident Representative Office in Vietnam in 1976. Palestinian people’s great leader – late President Yasser Arafat and other members of PLO paid many official and friendly visits to Vietnam before and after the liberation of Viet Nam in 1975. The leaders of both countries had forged a close bond during the struggle of both nations against occupation and colonialism. Palestine President Mahmoud Abbas’s visit to Vietnam in 2010 opened a new important phase on the road to the development of relations of friendship and cooperation between the two countries.